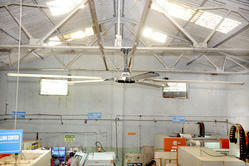 Manufacturer of a wide range of products which include hvls fans. A high-volume low-speed (HVLS) fan is a type of mechanical fan greater than 7 feet (2.1 m) in diameter. HVLS fans are generally ceiling fans although some are pole mounted. HVLS fans move slowly and distribute large amounts of air at low rotational speed– hence the name "high volume, low speed." Typical applications for HVLS fans fall into two classifications—industrial and commercial. In industrial applications, air conditioning is often cost prohibitive or impractical. Fans installed in spaces like warehouses, barns, hangars and distribution centers can prevent heat stress, increase worker comfort and the productivity of both workers and livestock. HVLS fans are also used in commercial spaces, where air conditioning is more common, but increased air movement from ceiling fans can cost-effectively augment occupant comfort or prevent stratification. Typical commercial applications include shopping malls, churches, office buildings, fitness centers and schools.